Mistakes happen and I’ve made more than my share. So, please, don’t get the wrong idea. I am not throwing stones. If anything, the person who made this mistake has my sympathy and support. But at the same time, I’m really glad I don’t have to take the phone calls. Hope the old boss is having fun. 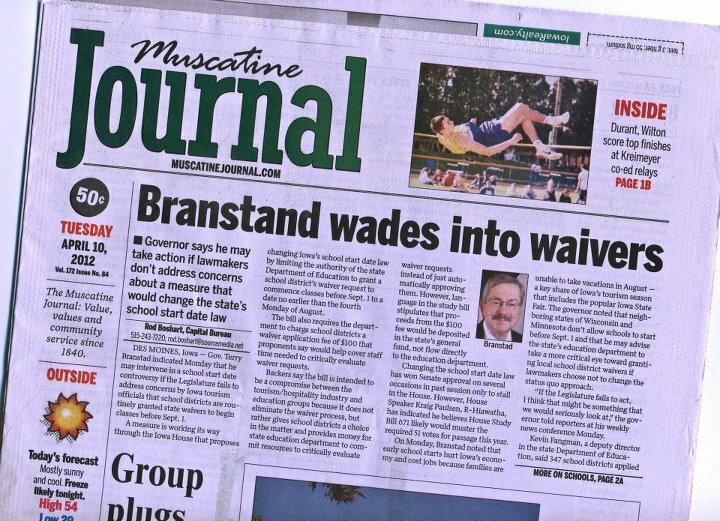 And for the non-Iowans among us, the governor is Terry Branstad. Calling him Brandstand, I’m sorry to say, is a mistake I have also made. Photo credit: I cancelled my newspaper subscription on Feb. 27 — and that’s another story for another day: How even an old newspaper guy like me can discover he doesn’t really miss the daily newspaper. Anyway, I borrowed this photo from Dan Clark, a Facebook friend. I hope he doesn’t mind. I don’t miss the paper either! It used to be the first thing I checked in the morning, and I can’t say I miss it! Kind of lame since you left 🙂 I also wanted to say that you inspired me (or maybe shamed me) into cleaning a closet or two today! I have discovered for a guy who hates to shop, Scott sure has a lot of shoes. I will continue one closet per day until they’re all done, and one day I will be brave enough to tackle the black hole that is our basement. For now, I will revel in the victory over one little closet. Enjoy your day! Maybe we need to start a rock music show, just for Iowa: American Branstand. Hey, Everybody makes missnakes. . … . . .